July 7, 2015, 8:44 AM · Why shouldn't symphony musicians have high-tech apparel, just like athletes do? After all, playing the violin or any other instrument certainly requires a degree of sweat and athleticism. The need for such gear is more acute for men, who usually have to wear restrictive tux shirts and jackets when playing a classical concert. 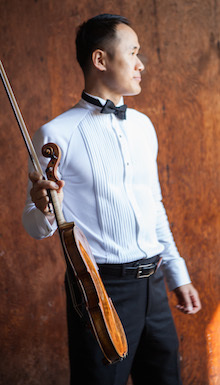 This is the issue that led violinist and businessman Kevin Yu to found a company called Coregami, with the stated mission of designing the perfect concertwear for musicians. In June they introduced their first product to the world: a tux shirt. I talked with Kevin about what inspired his company and about what makes this tux shirt different from others. Laurie: What is your background, as a violinist? 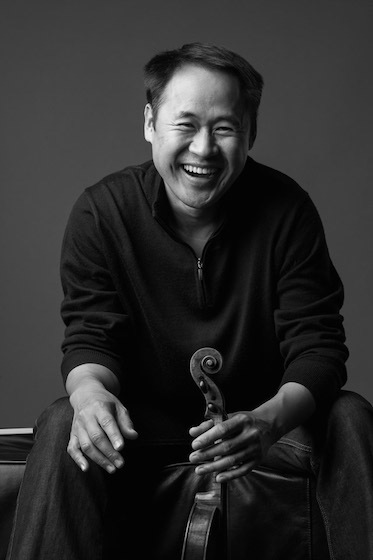 Kevin: I have studied with Michael Selman (Joseph Silverstein student), Vincent Frittelli (Galamian student), and Emmanuel Borok (former concertmaster of the Dallas Symphony). To my knowledge, I am the only person in the world who has declined music school on three separate occasions after gaining admissions (University of Michigan in undergrad, Northwestern University’s Masters Program, and SMU’s Artist Diploma program). Despite not having attended music school, I have served as the Principal of the Masters Sinfonia (in California) and have served as the Principal of the Las Colinas Symphony Orchestra (Irving, Texas). We were immigrants from Singapore. Crushing it in the classroom, being a teacher’s pet, and playing an instrument were basic expectations. But then I fell in love. Music was the only thing that could calm me down. Accolades and medals were followed by big scholarships to all the universities. Doing what you love is like getting a high-five for eating ice cream. My dual-focused career path started the moment I was accepted into the undergraduate business program. As soon as I had landed at University of Texas - Austin, I got a phone call from the violin professor who took me under his wings. I was a student by day and an intern at a tech startup by night. During my freshmen year, I became the concertmaster of the university orchestra and started getting calls to play with local symphonies. Although I didn’t attend music school, my professional resume was stacked before I turned legal. Laurie: What inspired you to want to make the perfect tux shirt? Kevin: There are three reasons: Personal frustration, lack of options in the formal wear category, and an abundance of options in other fashion categories. It’s true what they say – frustration is the mother of invention. I got frustrated when I couldn’t find the right tuxedo shirt. For more room, I always had to buy a size too big. And then I felt robbed, each time I paid a tailor to rig a shirt that was never designed for mobility. The idea of Coregami was conceived on the running trail. At the end of each run, I’m usually drenched from heat to toe. As I was cooling down one morning, I took a closer look at my Under Armour running shirt. It was stretchy, moisture-wicking, and light as air. I thought to myself, “Why can’t I be this comfortable while I’m on stage?” While backstage before a show, I began to float the idea of an athletic version of a tuxedo shirt. Just about every guy raised his eyebrow with a smile. Their response gave me the courage to take the next step. Laurie: How, and who, did you find to design this? Kevin: It was a long journey because I started at zero. I didn’t know the first thing about the fashion industry, much less how to design an article of clothing. But having worn formal wear for 30 years, I do have a clear understanding of what is comfortable and suitable to honor the occasion. It was uphill from day one. Selecting the right type of fabric felt like playing the lottery. But through a lot of research and meetings in Los Angeles, we were able to procure some really special materials from a world leader in the sports wear category. They took an active interest in our mission and continue to serve as a great partner and advisor. When we first started, everyone from the production team, pattern makers, and designers wanted to do things the old way. We came out with some really awful prototypes in the early days. The one thing that really helped us was that we always included the music community into our development process. We iterated through many prototypes and failed our way to a solution. Before long, we had our first minimally viable product. Laurie: What exactly have you come up with, in men’s concert wear? 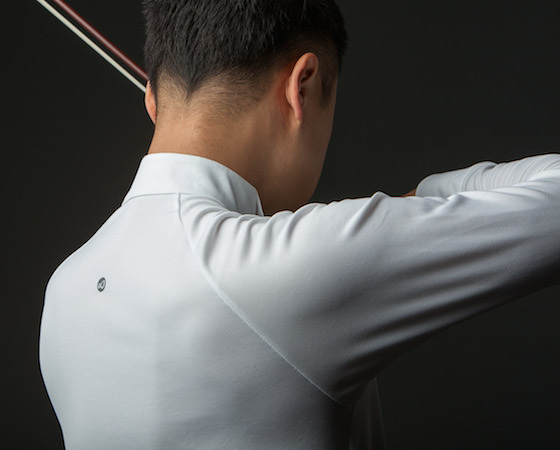 Kevin: Coregami’s first product (The Gershwin) is the first tuxedo shirt in the world that is designed for musicians, by musicians using the principles of high performance athletic wear. It is made from advanced fabric that is moisture-wicking, four-way stretch, and anti-odor. With an ergonomic open shoulder pattern, seamless stitching, and lighter fabric, our testers call this “the best tuxedo shirt ever designed." Laurie: What, very specifically, makes these shirts different from the typical tux shirts? Kevin: Formal wear was conceived in the last century and was never intended for active movement. With the desire to incorporate modern athletic concepts, we knew we had to take a different approach. Through rounds of testing with some of the most elite musicians in the United States, we failed our way to a solution. Fabric: No more cotton or cheap polyester. The Gershwin uses an advance fabric that has four-way stretch, moisture-wicking, and anti-odor capabilities. New Pattern: The old shirt patterns have stitches that intersect right where we require the most amount of movement … at the shoulders. We researched shirts used by professional golfers and came up with the “Open Shoulder” design to increase range of motion. Cuffs: French cuffs look nice, but musicians often complain about the weight and unnecessary bulk. Cellists complained about the cuff links and accessories hitting their expensive instruments. We moved to single cuffs to reduce bulk. Low Maintenance: Professional musicians play 3 – 4 concerts, 20 – 40 weeks a year. With advanced fabrics, say goodbye to expensive dry cleaning. Simply wash and hang dry. Laurie: Have you tried playing in the new gear, and is it a different experience? In what way? Any surprises about how it feels? Kevin: Yes – it is a drastically different experience. The comment that we hear the most is that it is extremely light and breathable because they no longer have to wear an undershirt. The trifecta of formality, comfort, and high performance has never come together – until now. We had addressed much of the performance issues before we released the product to the public in June 2015. July 7, 2015 at 09:27 PM · That's incredible! I hope they make some women's performance wear next! July 7, 2015 at 11:25 PM · So where do we get them? Absolutely brilliant idea! July 7, 2015 at 11:35 PM · Here is the link! July 8, 2015 at 03:36 AM · Women's button up shirts please! July 8, 2015 at 03:58 AM · I could see this in use for dance companies as well! July 8, 2015 at 05:01 AM · When will Mr. Yu add women's blouses to his line-up? July 8, 2015 at 09:24 AM · Do they do a normal collar shirt? In certain orchestras, wing tips are not dress code-friendly. Also, with wing tip, your bow tie can slip up over the collar to easily. Especially for violinists and violists. July 8, 2015 at 10:18 AM · Finally! July 8, 2015 at 01:51 PM · This is a great innovation for musical performance by men. This will be great for playing the double bass. My question is which brand would be the best undershirt to wear with this new tux shirt? Granted in the article it is stated one doesn't need to wear a T-shirt however playing in performance halls located in the northern tier of the country these places can still be cold despite having a heating system. Perhaps Kevin could consider developing one to meet the same requirements as his tux shirt. Should he be into it, my preference is a V-neck style. And how soon before they develop a tux and tails coat to meet the same standards for freedom of movement. Coats are just as restrictive if not more so. Best to kick in the dress pants to have a complete performance wardrobe. Thanks for this innovation. I will have to save up my pennies for starters with getting the tux shirt! July 8, 2015 at 02:54 PM · Any plans to release a version with a standard collar and french cuffs? I'm a singer, so I *love* the idea of the moisture-wicking fabric and room to breathe, but I prefer the style of the standard collar and french cuffs, and since I don't do much with my arms but hold a folder of music I don't have any issues with "catching" or weight. July 8, 2015 at 04:14 PM · What a great idea, and congratulations on bringing your idea into reality. I think there is a real market for this in any venue that requires a tuxedo--wedding wear, for one! July 8, 2015 at 04:16 PM · Great innovation ! I do share the need of having one of these shirts !! July 8, 2015 at 05:49 PM · Comfortable clothing for all pursuits is a wonderful idea, and this seems to be no exception. But too bad they put that advertising blotch on the back of the $120 formal shirt to reduce it to the level of a child's T-shirt. July 8, 2015 at 07:34 PM · A black version would be great, too! July 8, 2015 at 08:51 PM · Finally!!!! My husband plays violin and my son plays cello, this will be very useful for our family! July 8, 2015 at 10:36 PM · Hi, I play bass in pit orchestras. We don't wear jackets, but need black shirts. I can't wait. July 9, 2015 at 03:02 AM · Kudos for bringing this great idea to fruition. I sure hope it catches on- there are endless possibilities. Formal wear has a long history of development for more comfort (open-back waistcoats), easier motion (formal dance pumps and loose comfortable shirts and braces), and easier maintenance (detachable collars and for a while, separate dickies). Continuing this trend is admirable. Personally I'd hope that we'd see more development on white tie specifically, instead of less formal tuxedo wear, but it's all to the good. July 9, 2015 at 04:44 AM · I would like one of these myself! I go to many classical concerts and wear a tux to all of them. However, I would want the ability to have French Cuffs as well as shirt studs. I certainly hope it comes to be available very soon. Congratulations! July 9, 2015 at 08:35 AM · I'm not a musician. This seems like what James Bond would be wearing. Looks like a tux shirt but is practical. July 9, 2015 at 12:45 PM · For all those people wondering where/how to buy these: follow the link to Coregami in the article, then the link to "Shop". Presumably any other products they later develop will eventually be available there as well. July 9, 2015 at 08:49 PM · Ballroom dance competitors have to wear tux shirts too. This would be very helpful for the dance community. July 9, 2015 at 10:27 PM · This looks great! Now, can white, and black blouses/tops for women playing in orchestras be designed next for sale? July 9, 2015 at 10:50 PM · I've been looking for a shirt like this for years to surprise my violinist son. Is it made in black? Is it available for purchase. July 10, 2015 at 02:54 AM · Greetings everyone! The past few days have been unbelievable. The story from Violinist.com raged through the social web. My inbox exploded. I pulled a college all-nighter to respond. European radio stations and newspapers want interviews. Major retail outlets want to carry the product. Major symphonies keep calling (as well as my mother). It's been a roller coaster ride. What I would like to say is THANK YOU! This project is a labor of love and I will do my best to serve my musical community. "I stand on the shoulders of giants"
July 11, 2015 at 05:07 PM · My husband is a conductor.....very interested!!! Where do I get one? July 11, 2015 at 05:58 PM · I read the entire interesting article, but honestly it's just marketing hype. There is no artificial fabric in the world that comes even close to the comfort of cotton, single cuffs are nothing new, and there is nothing inherently "restrictive" about conventional shirts as long as they fit properly, i.e., aren't too small. I don't expect you to approve this comment since it is "critical", but just wanted to offer some sincere feedback from someone unimpressed, for what it's worth to you. I will say that it's a well written article, though, despite the typos. July 11, 2015 at 09:10 PM · I'm an active amateur trombonist in Floridaand have wanted cooler and more comfortable formal wear for years. My own redneck idea involved a sleeveless tux shirt with fake cuffs sewn to my tux jacket but this sounds like a more acceptable alternative. I wear moisture wicking shirts for both work and golf and am anxious to try this shirt out for performances. July 12, 2015 at 04:39 AM · does anyone know where I can purchase one?